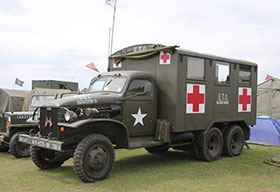 You can expect to see one of the largest gatherings of Historic Military Vehicles & equipment from all major periods in South East England, featuring the best historic groups, re-enactors & living history displays in the country to give our visitors a real experience of life in times past. Arena activities will take place during the day with military vehicle parades where you can see these historic vehicles in motion. Military vehicles across all eras and nationalities from push bikes to massive trucks that make the tanks look small as well as classic cars, bikes and busses. Live wartime entertainment will take place in the huge marquee throughout the day. Child Tickets £5 - Children are considered to be from 2 to 15 years of age, under 2's enter for free. Family tickets are for up to 2 adults and 2 children. Concessions are available to those over 65 years of age only, veterans of any conflict (over 65 years of age), with a MOD issued veterans badge and serving members of HM Forces (with ID). Please do remember to bring the appropriate documentation.